Fermented foods are highly prized for their medicinal-type properties. Rich in beneficial yeasts and lactic acid bacteria, they support gut health and digestive function. Kombucha, kefir, natto and fermented soybeans are used as food and medicine worldwide. 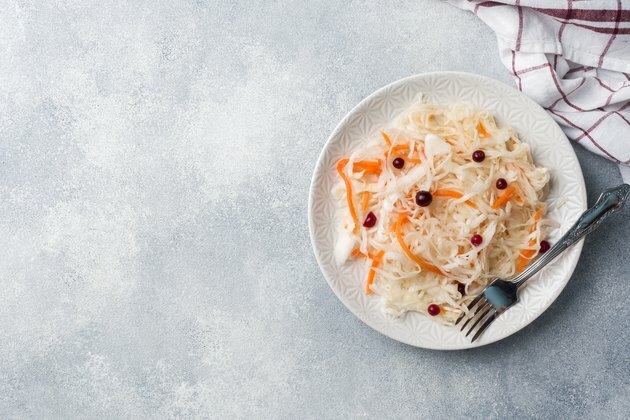 Clinical research supports the health benefits of sauerkraut, which include better digestion, weight loss and improved mental health, among other aspects. This popular food has been around for about 2,000 years and can be found in just about every culture of the world. Its name means "sour cabbage" in German. Thousands of sauerkraut recipes exist today, from Russian sauerkraut salad and sauerkraut pickled with carrots to baked sauerkraut and apples. But did you know that this superfood is a powerhouse of nutrition? Sauerkraut is made by fermenting shredded cabbage with lactobacillus bacteria. Basically, you must combine cabbage with salt in an airtight container and let it ferment for several months. Add spices, cranberries, beets, caraway seeds or shredded carrots, if desired. Fermentation by live bacteria takes place naturally. According to a 2014 analysis published in Global Advances in Health and Medicine, this functional food provides high amounts of vitamin C, vitamin K and lactic acid. It exhibits anti-inflammatory and anticarcinogenic properties, leading to better health and well-being. Beware, though, that sauerkraut may cause allergic reactions and should be consumed with caution, especially by people who suffer from seasonal allergies. Sauerkraut is rich in histamine and may cause adverse reactions in those who are prone to allergies. Vitamin C, one of the most abundant compounds in sauerkraut, protects against infections and oxidative stress, according to a 2017 review featured in the journal Nutrients. It may also speed up post-workout recovery and shorten the duration of common cold episodes. The vitamin K in sauerkraut plays a vital role in bone health and may help prevent osteoporosis and heart disease. The health benefits of sauerkraut are largely thanks to its probiotic content. According to a 2018 research paper published in Frontiers in Microbiology, this fermented food boasts trillions of live bacteria that restore the gut flora, destroy pathogens and prevent diseases. The gut has a direct impact on your immune system, brain function, mood and emotions. A diet rich in sauerkraut and other fermented foods will keep your gut healthy and boost your natural defenses. Sauerkraut is one of the best dietary sources of probiotics, such as Lactobacillus plantarum, L. brevis and Lu. mesenteroides. These live microorganisms can boost brainpower and cognition, according to a 2016 review published in Preventive Nutrition and Food Science. The beneficial bacteria in fermented foods fight inflammation and produce fatty acids with neuroprotective effects. They also protect your brain from oxidative damage and modulate the release of serotonin, GABA, BDNF and other neurotransmitters. These findings show that fermented foods have a positive impact on your mood and brain health. In fact, researchers at the College of William & Mary have found that probiotics, especially those in fermented products, may positively alter the gut flora and ward off social anxiety. This could be due to their ability to increase the levels of GABA, a neurotransmitter with antidepressant and anti-anxiety effects. Sauerkraut is also rich in phytochemicals that promote optimal health. Its antioxidant and anti-inflammatory properties are well-documented. According to a 2017 research paper published in the journal Current Opinion in Biotechnology, fermentation enhances the conversion of flavonoids and other polyphenols to biologically active compounds that protect against oxidative stress. At the same time, it increases the bioavailability of certain amino acids and B vitamins. You've probably seen those TV commercials saying that yogurt aids in digestion and prevents constipation. Yogurt is a fermented food — just like sauerkraut. Both products keep your digestive system running smoothly thanks to their probiotic content. The lactic acid bacteria in these foods improve digestive function and may lower your risk of colorectal cancer. Sauerkraut is particularly beneficial for people suffering from irritable bowel syndrome (IBS) and inflammatory bowel disorders (IBD). In a 2015 clinical trial published in the World Journal of Gastroenterology, IBS patients who took probiotics reported less-severe abdominal pain, reduced bloating and better quality of life. Their symptoms improved significantly. These microorganisms decrease gut permeability and alter the microbiota, which in turn, may relieve IBS. Another study, which appeared in Clinical and Experimental Gastroenterology in 2014, confirms the beneficial effects of probiotics in IBD management. These live bacteria strains may help prevent ulcerative colitis flare-ups and maintain remission. Sauerkraut may also stimulate bowel movements and keep you regular thanks to its high fiber content. Both fiber and probiotics benefit digestive health. Serve sauerkraut as a side dish; mix it in salads; experiment with sauerkraut recipes from all over the world to reap its benefits. This functional food isn't just healthy but also low in calories. One cup of sauerkraut has fewer calories than the same amount of fresh spinach, carrots or apples. Plus, it's a good source of fiber, which promotes satiety and inhibits hunger. The probiotics in cabbage may help with weight loss too. According to a 2015 study published in the journal Obesity, certain probiotic strains, especially those in the Lactobacillus genus, may prevent weight gain and fat accumulation. These beneficial bacteria may also reduce body fat mass and balance the hormones that influence appetite. Due to its high sodium content, this functional food may cause water retention and raise blood pressure. Sauerkraut — like most fermented foods — is quite high in sodium and may cause fluid retention. The number on the scale might go up after you eat sour cabbage or pickles. However, this doesn't mean you've gained weight — it simply means that your body is retaining water. Excess sodium also increases blood pressure, which may affect cardiovascular health. University of Maryland Extension: Harford County Master Gardeners Monthly Newsletter, December 2015: Sauerkraut! The Finished Product!